In anticipation of the New year begin to think about how this event to meet. How, with whom and most importantly where? Without a doubt in the second half of December, each of us thinks about it. Of course, there are those who have already decided everything in advance, but there are always a minority. You want a holiday with fun and unforgettable memories. Plunge into the atmosphere of a holiday will help visit to St. Petersburg, and comfortable to spend holidays in the Northern capital is ready to help the company Hi-Tech Home Apartments which is always happy to provide to rent their flats, apartments and suburban homes to their customers. Every new year's eve the city on the Neva impresses with its elegance and range of different events. The whole city is decorated with garlands of LEDs woven in various color patterns, around beautifully decorated Christmas trees and Christmas trade. Especially now decorated Nevsky Prospekt, to the normal lighting of historic buildings which were added garland above the roadway, jewelry on poles, street lamps, almost all major areas are decorated with toys and electric garlands Christmas tree, many buildings are also decorated with numerous led lights. On Fontanka, Griboyedov canal and Kryukov canal hung from one coast to the other a variety of lighting decorations. 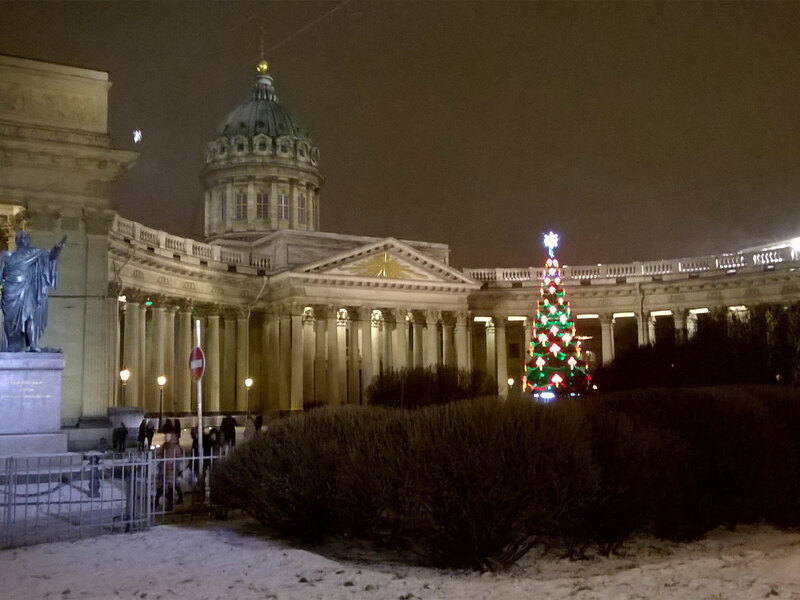 Beautiful Christmas tree installed on the Palace square, Vosstaniya square, the Kazan square. it's safe to say that even an ordinary evening walk in St. Petersburg will bring a lot of pleasant experiences. Gain experiences you can think about gifts for the New year and Christmas. The benefit for this city in December and January will be working a lot of Christmas fairs and bazaars. Unfortunately, Christmas Bazaar at St Catherine's garden, which year in a row did not take place, although he has always been the hallmark of the Christmas city in Soviet times. But there were new year fair at pioneer square in front of the Theater for young spectators, on Zagorodny Prospekt metro station Zvenigorodskaya and Pushkinskaya. Also for the consecutive year was opened new year and Christmas fair in the Central Park of culture and rest them. S. M. Kirov, which is not Elagin island. However, a visit to a huge number of shopping centers, for example: Gostiny Dvor, DLT, Passage, etc. also will allow you to buy a lot and including Christmas. Don't forget the many original shops in the center, where you can find a lot of interesting and attractive. Many night clubs, restaurants and cafes are also happy to take You in my arms and not only new year's eve. by the Way about new year's eve, on the banks of the Neva will be held at which time a pyrotechnic light and music show. The amazing spectacle that is worth seeing. If You want to celebrate the New year in our apartment is also a great option, especially in the circle of a close loved one. All the conditions for that. In General, if you want perfectly to celebrate the New year and/or Christmas book our apartments, and come.